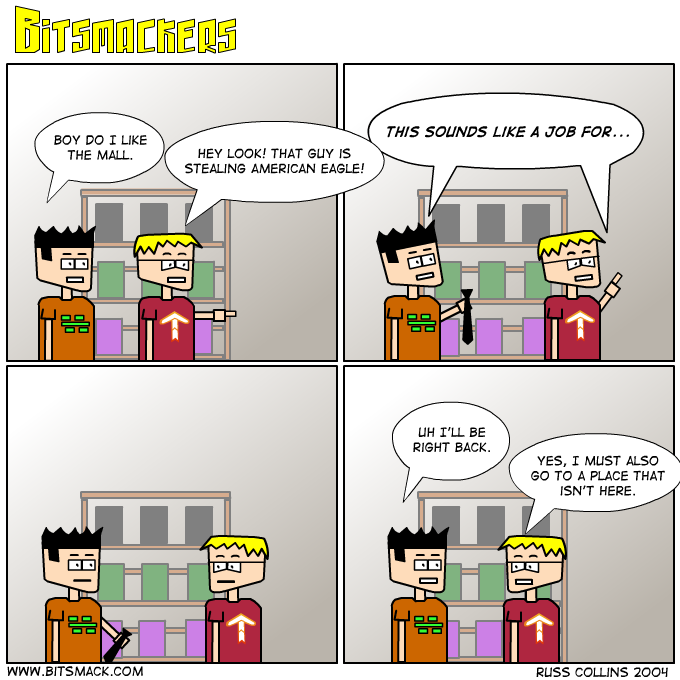 <a href=http://www.bitsmack.com/modules.php?op=modload&name=Comics&file=index&action=comic&id=416>Today’s comic</a> is inspired by all the comics I’ve been reading lately. Well actually there was just two, and one kinda sucked. I’m trying hard to decide what direction to go with the comic so I’ll leave it up to you the viewer. Should I do one shot comics about video games, movies, whatever, or should I do longer superhero type storylines? Also, I did a physical inventory of the 1st ever special edition Bitsmack T-shirts and found that there are only 18 left, 9 large and 9 x-large. If you ever considered buying one you should do it now because once they’re gone, they’re gone for good. While I may do more Bitsmack shirts this design won’t be made again.